Below is an account of how we constructed our pond and some of the wildlife it brings to our garden. 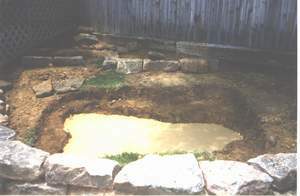 In Spring of '97 we made plans for putting in a garden pond. We had the perfect corner which had a slight slope to it which would lend itself to a small water fall and also had enough sun during the day to grow plants such as lillies. We started off by buying a pre-formed shell for the main pond and started to dig the area that would hold it. We also bought large rocks from a local stone supply and positioned those in front of the pond as well as behind it, to give support to the sloping ground. 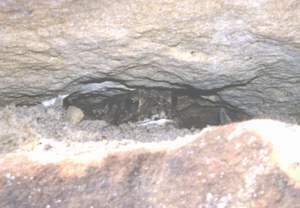 These would give plenty of places for toads and lizards to hide in and provided a nice wall for plants to be tucked into, as well as a sitting area. Two smaller top ponds were also dug which would have a liner underneath, flowing into the main bottom pond. The size of the pond is 61/2 x 71/2 feet and 18" deep. It is not deep enough for Koi, which need a minimum of 2 feet in depth, but certainly for Goldfish which I wanted several of eventually. With the excavation done, pond shell and liners in, and the third row of the stone wall completed, we backfilled with good dirt and placed a mesh liner behind the stone wall to help prevent dirt from washing out from between the rocks. After the pond was filled with water we put in a 1600 gal per hour pump strong enough to pump the water up to the top and back down the falls. 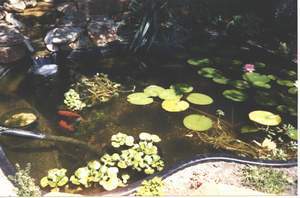 A biological/mechanical filter was added at the top and lillies and other pond plants put in the pond to improve water quality by increasing oxygen. Then, all we had to do was wait and just let nature take its course. The fresh water was beautiful and clear for about 4 days and then came the algae, which is a natural process. It turned a dark brown/green and looked terrible, the bottom completely invisible, but we waited. Then about 3 weeks later the water suddenly started to clear, literally with in a few days. Natural bacteria had built up inside the filter cartridges and within a day or two the pond was crystle clear! I put some goldfish in there as well as some little minnows which keep the surface of the water clear of anything. Finaly, shrubs and perrenials were planted around the outside. I planted a groundcover around the edge to help hide the plastic pond mould. Native and drought tolerant plants were picked for year round color. Almost 6 years later the pond is doing great and the shrubs around it have matured. The Goldfish take food out of my hand, toads nest and overwinter in the rock crevices, American Fence Lizards bask on the hot sunlit rocks, birds bathe in the water and beautiful Dragonfiles come each year to lay their eggs in the pond. It is a complete ecosystem and theres always something interesting going on there if time is taken to look! Ten years later the light conditions around the pond changed a little more, becomming more shady, so new plants including ferns & columbines were planted. 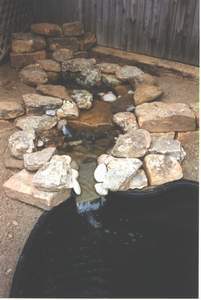 The two top ponds were turned into more of a stream by filling in the ponds with river stones. This enables the birds and wildlife to enter a lot easier and now they love bathing in the shallower water! Adding a pond is one of the nicest improvements added to our yard. The sound alone is so peaceful and attracts birds that may otherwise fly by. I keep it running all year without a problem as our winters here, although they get cold, only remain extreme for a few days and the fish and plants overwinter without any problems. 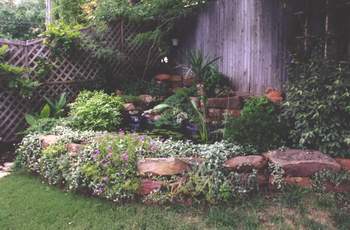 Over the years I've used several different kinds of pond plant. Plants, along with a filter, are used not just for decorative reasons but also to bring oxygen into the water and keep the water clear. 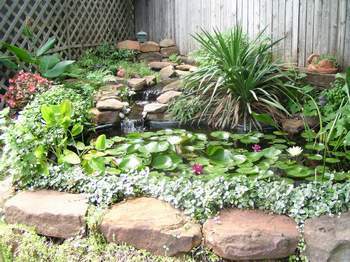 When first setting up a pond and trying to clear the water for the first time, a mix of surface plants and underwater plants will help to balance the water quickly and effectively. They work by absorbing the carbon-dioxide in the water and turning it into oxygen. This eventualy overpowers the algae growth, which competes for the carbon-dioxide. Once plants are established, algae dies off. Algae loves the sun and as the majority of ponds are placed in spots where they will get a good deal of sun, to enable other plants such as lillies to grow, algae can be a real problem. 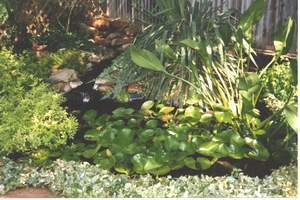 One of the quickest ways to control this is to cover the surface of the pond water with floating type plants. They will multiply quickly and eventualy cover the surface and shade the water below. This in time kills off the algae. So if you're starting out with a new pond, or even an old one and you've got algae or blanket weed taking over then get lots of surface plants in there along with some mixed submersible potted plants and shelf plants, known as marginals. There are many types out there so you can get an assortment. Make sure that your filter is working and running 24hrs a day to help build up beneficial bacteria. Once the water is balanced and clear you can thin out some of the plants. Approximatly 2/3rds of the pond surface should be covered for the best control. Duckweed, Hardy Lillies. 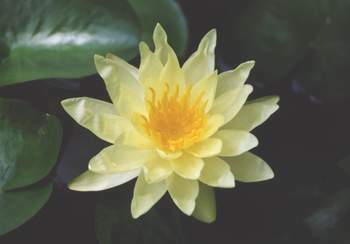 (Lilly pads do an excellent job of covering the surface) The more native plants you can include however, the better. This is a very pretty plant with its pale green leaves and lilac flowers. However, it is ILLEGAL to even possess this plant in Texas, with hefty fines and even imprisonment. 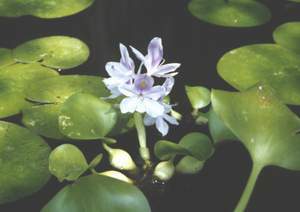 It is not native here and causes many problems when it finds its way into local water ditches and streams by taking over other plants and clogging waterways. So, if you have some in your pond, remove it immediately and dispose in the trash. Do NOT toss it into local waterways. There are many other very suitable surface plants available for you to choose from. NTWGS North Texas Water Garden Society. Lilyponds Water Gardens Pond supplies, pumps to plants. Little Giant Design your pond online. Patio Garden Ponds Products and info. 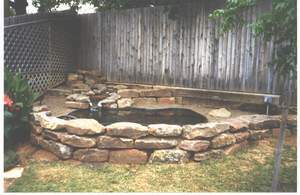 The Garden Pond Dedicated to ponds. Photos of pond lay-outs. 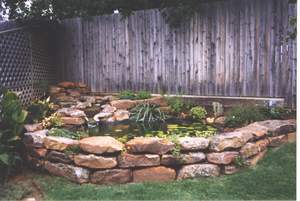 About.com-Gardening How to...Ponds and water features. Earth Ponds Sourcebook The Pond Owner's Manual and Resource Guide. Streams Their ecology and life. The Master Book of the Water Garden The ultimate guide to the design and maintenance of a water garden.